"Ambassador of peace Exhibition and Conference"
and I have therefore decided to give it one more try. The problem is, that some of you are not sure where they are going to be next summer, some are in the armee, some study abroad ect. we set up the exhibition. This means that you are sending me things to be shown as part of the exhibition, regardless of whether you think that you can actually come to Vienna next July. should show in what way you are NOW acting as an ambassador of peace. It could be anything, a video-clip, a film, a collection of your own prose, poetry, music, a sculpture, a speech, a video-message - anything counts. As soon as I can present at least 40 valuable exhibits to our committee I can proceed to fundraising and planning the exhibition. So I am waiting to receive your outlines/drafts/exhibits toll end of September 2013.
due to take place in Vienna, Austria, in July 2014. Your project should be realized in the months preceding the exhibition. Your first precise outline/draft/description must be presented not later than September 30th, 2013. You will then have time ot actually realize your project and to choose your own way to present it at the exhibition. If your project is a group project, you may choose the person who you delegate to present and represent your work at the conference. A Jury will choose 40 projects (10 from each group) from all the proposals presented to us. These projects will be the focus and core event exhibited at the Exhibition and their authors will be invited to the conference. Your AMBASSADOR OF PEACE PROJECT should reflect your own personal way to act as an Ambassador of peace. It can be a piece of work of any kind in any mode you choose - a peace-project in which you are involved, a peace project that you have initiated, peace thougths reflected in your thoughts or writings (a collection of your own poems, songs, a play, a piece of music of your own, a film, a documentary,) or in your actions. In this first stage you are requested to outline/describe what you plan to present at the conference and to send an example that shows what exactly you plan to do as a project and how you are going to show this at the Conference. . .
Further instructions will be given to you in the course of time. From all the drafts we receive, a jury will chose those which will be shown in the exhibition. Of course everybody can send a draft; the more I receive, the better the chances to set up the exhitbition. I cannot apply for funds before all the drafts are here. So please start thinking about what you would like to show and start preparing your Ambassador of Peace piece of work. I will let you know until which date your draft-and-outline need to be in my hands in order for me to apply for funds. You do not have to actually FINISH your work in this first stage, but you MUST send an elaborate outline, that explains exactly what and how you are going to show your work at the Exhibition & Conference. The drafts and outlines must be sent to my personal email-account, bohmer@utanet.at re: Ambassador Exhibition. 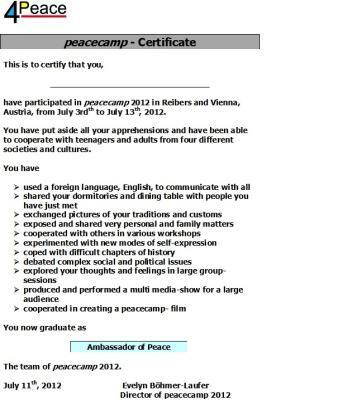 A conference is planned at which Ambassadors of Peace, who have participated in one of the ten peacecamps that took place in Austria and in Israel since 2004 – see 2012.peacecamp.net – will meet and exhibit the results of their work as Ambassadors of Peace. This first Ambassador of Peace Conference will take place in Vienna/Austria and last three days. All participants of the conference will be titled “Ambassadors of Peace”. The conference will mainly be designed and realized by the Ambassadors who attend it. The realization of the conference is totally contingent upon the cooperation of all who attend it. By joining one of the ten peacecamps which took place since 2004, you have manifested interest in the complex issues which are part of the social and political landscape of your own region. You have given thought to the very difficult problems which block the way to peace in Israel/Palestine and learned about past and present social and political problems in Europe. During peacecamp, you have discussed these issues with people from other countries and have exchanged ideas on how to resolve the problems of your region and of your time. You took a lot of new thoughts and ideas back home from peacecamp and may have continued developing your own and your friends' ideas about the obstacles to peace in your region and ways to resolve them. You have become an Ambassador of Peace. We would now want you to share your own personal way of promoting peace as an Ambassador of Peace. Please send us a piece of work which you have performed during the last one or two years prior to the conference which shows your own personal way to relate to these questions. Your contribution may be an individual work or a group work, according to what you chose. write a song or a poem, or produce a sculpture, a video film, a show, a painting, a drawing, a text or any other a piece of art - something of your own way of expression, content and style that can be shown in the exhibition as your own contribution as an Ambassador of Peace. We will expose all the contributions we receive from all the Ambassadors of Peace who attend the conference and would like you to be there and to show what your contribution is all about and how you deal with the word peace within your own group of reference. fill a registration form (will be provided) with their full name and contact data (name, e-mail, post address, telephone number, year of their peacecamp), declaration of cooperation and signature. Minors must present their parents' signature. submit a piece of work representing their personal involvement with peace work – this could be the description and presentation of a peace-project in which they are involved, an article, a painting, a song, a video film, a book, a sculpture, a drawing, or any other piece of work portraying the ambassador's attitude, ideas or enhancement of peace in the context of their own region and their own world. A deadline will be set for applications and submission of contribution. In order for the conference to take place, registration forms and submission of contribution must be presented within deadline (to be announced). The organizing committee will evaluate the submitted pieces of work and set up an exhibition of the Ambassadors' peace work. At the conference, Ambassadors are expected to present their work to the audience and to elaborate on their ideas about peace work within their own living context. The organizing committee will organize a few activities/workshops to take place within the conference, based upon and around the focus of interest reflected by the pieces of work submitted. We need the cooperation of all of you in order to be able to realize the plan of the Ambassador of Peace Exhibition and Conference. Without your personal contributions/exhibits, there cannot be an exhibition and without it, thee will be no conference. I NEED TO RECEIVE AT LEAST 30 (THIRTY) DRAFTS OR PROPOSALS OF PIECES OF WORK TO BE SHOWN IN THE EXHIBITION IN ORDER TO BEGIN PREPARING THE CONFERENCE. PLEASE SEND YOUR DRAFTS AS SOON AS POSSIBLE. Information about duration, dates and participation fee will be announced at a later stage. when preparing your project for the exhibition, please take the 4 questions4peace as guidelines. what can you do now and what will you do in the future in order to make your own world more peaceful? The Ambassador of Peace Exhibition and Conference will take place in Vienna, Austria. The date will be set after 30 drafts of exhibits have arrived. Details about date, fee and participation procedure will be announced later. 1. What does the word peace mean to you in the context of your own life? Peace is having the freedom to express yourself without judgment and ridicule. Peace is having the ability to maneuver on a daily basis, without fear of isolation, harm, or some form of retaliation for being who you are. Peace is something that is often taken for granted by those who can have it at any time they choose. Lastly, peace is more than just a sign – it is a blessing for those who have and appreciate it. 2. What are the main obstacles to peace in the context of your own life? Nationalism, greed, power, and ego... it is a pity that some governments cant get past these factors, and I think that when the power of love overcomes the love of power the world will know peace. So we should tare the hatred from our hearts. 3. What have you done so far to promote peace in your own country? i participated in several peace projects, and i made a project about world peace . 4. What can you do in the future to promote peace in your own country? i think that we can achieve peace in this country, but in order to achieve it we should listen to the other side first. And I have a duty for my country so I will volunteer to help my people whenever i get the chance. Please send me OUR DRAFT as soon as possible. 1) i participated in a peace camp(PCFF Youth 2012 Summer Camp) which took place in Givat Haviva(israel). 2) i made a project about peace and checkpoints in israel.